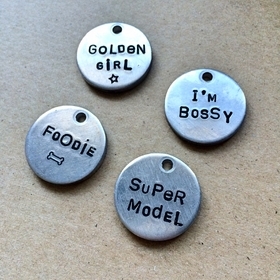 Super thick, light weight, these aluminum tags are easy to wear and will last a long time! Customizable on both sides, design yours today. Each side can accommodate 2-3 words, and a symbol if you'd prefer. Two sizes, 1" and 1.25" diameters. Handmade with love in the U.S.A.